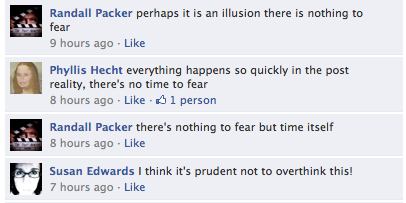 In the post reality, there must be performance everywhere, even Facebook! That non-place where 500 million users are passing notes to one another… that non-place which has become McLuhan’s global village… that non-place that defies even the smartest GPS devices. Thanks to everyone who participated in Ten Probing Questions for the Post Reality. You have become part of the first happening on Facebook!